We report the discovery of two distinct types of ellipsoidal binary systems occupying, so called, sequence E on the period-luminosity (P-L) diagram. We propose that steeper P-L relation is composed of giant-dwarf binaries, while the other consists of giant-giant binary systems. Analysis is based on a sample of 5334 objects, which we select from the OGLE-III survey data toward the the Large Magellanic Cloud. We show that one of the components of ellipsoidal binaries is typically either a Red Clump or a Red Giant Branch star, which leads to clear separation split of the sequence E at P = 40 d. In its short-period part, we identify two subsequences corresponding to the two types of binary systems (E2 and E3), while in the longer-period part the two groups merge forming a single subsequence E1. We extract a group of 271 ellipsoidal systems with eccentric orbits, from our sample and present the period-luminosity relation they follow. 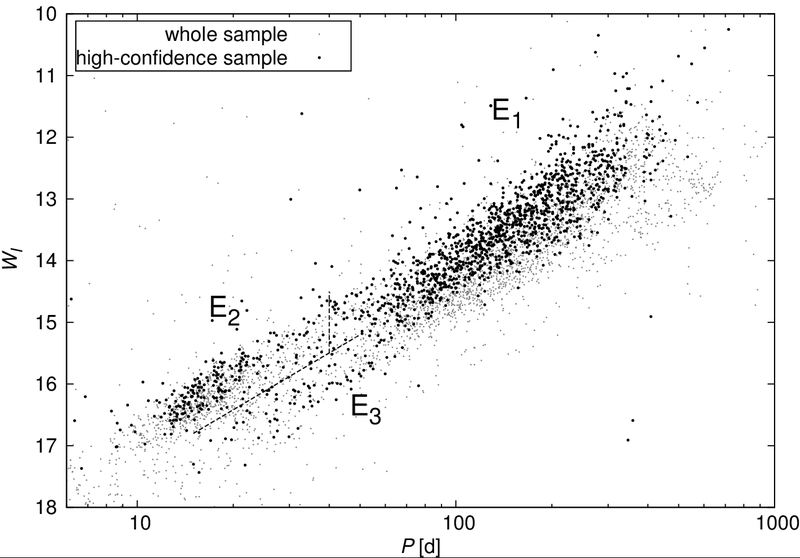 P-L diagram for high-confidence sample of ellipsoidal binaries (large black points) and for the whole sample (small gray points). Division into three subsequences E1, E2, and E3 is shown. 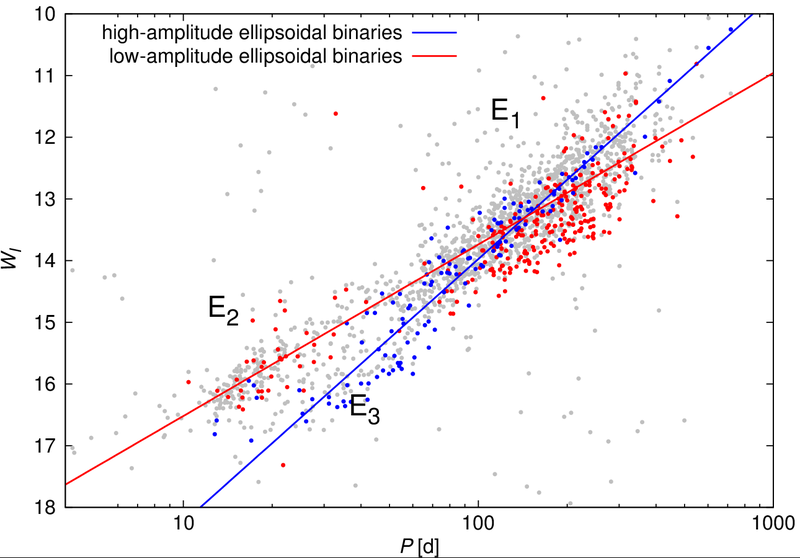 P-L relation for low- and high-amplitude ellipsoidal systems. These two groups are likely giant-giant and giant-dwarf binaries respectively. Any comments are welcome. Please send your messages to this address.